What is the value of money and fame in the commercial art world? Is it worth dying for? 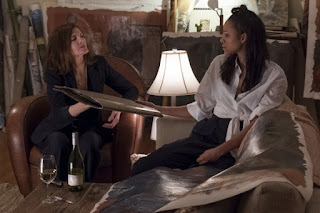 Dan Gilroy's uniquely-titled horror Velvet Buzzsaw promises a scathing indictment of the art scene just as the director's Nightcrawler did a slash 'n burn on the L.A. media. Gilroy once again casts Jake Gyllenhaal in a playful lead role, along with the director's wife Rene Russo, and while the film offers some gory fun for those looking for a high-end Final Destination, those expecting more will find the paints have run a bit dry. The intersection of art and commerce is Gilroy's target, where wealthy L.A. elites pay millions for the hottest new thing. Art may be subjective but at this level it's not the art that matters, it's who likes it that drives up the price, and chances are they were told to buy it by an "art advisor" looking to get a cut. The entire system is based on nothing but greed, even the artists themselves play the game. Gyllenhaal's pretentious art critic Morf Vanderwalt, god even the name makes you want to smack him, has a role in this game, too. A good word from him can make a career; a bad one could see an artist's entire show packed up and locked away in a storage shed somewhere. "Critique is so limiting and emotionally draining", he says with a straight face while judging an artist's latest work. Perhaps the sting of bad reviews for Gilroy's previous film, Roman J. Israel Esq. has him ready to bite the head off critics, but his critique is superficial and best left aside, because Velvet Buzzsaw is best viewed as pure horror camp; the sillier and bloodier it gets, the better. Most of the characters in Morf's orbit are pretty awful, and definitely don't give a damn about art. There's art dealer Rhodora Haze (Russo), whose disgruntled employee Josephina (Zawe Ashton) has discovered a trove of art in the home of her deceased upstairs neighbor, Ventril Dease. Rather than turning it in or just throwing it away, she shows it to Morf who is "ensorcelled" by it. Realizing they can make millions, Rhodora and Josephina set off to cash in on the dead man's many pieces. Gilroy isn't attempting to break the wheel here, and that's admittedly pretty disappointing given what he's done in the past. Velvet Buzzsaw is a straight-up horror and Gilroy plays to that, as anyone who dares to profit from Dease's art meets a grisly fate. And these murders all happen in ways that are predictable, ironic, and usually pretty humorous. We can see each death coming a mile away; basically if somebody's alone with a piece of Dease's art, start covering your eyes. But even when the deaths occur Gilroy leaves a little bit of room to knock L.A.'s indifference. After one particularly gruesome death at a ridiculously ostentatious exhibit, attendees assume the mangled corpse and pools of blood are just part of the show. Acting as more of an ensemble piece, Velvet Buzzsaw makes the most of its talented roster of stars. Gyllenhaal's art critic is snobby, desperate, and more than a little bit sad. Morf is pretty despicable, while Russo, Ashton, and a cast that includes John Malkovich, Toni Collette, Daveed Diggs, and John Malkovich all play characters we're eager to see get what's coming to them. What Gilroy doesn't do is use Velvet Buzzsaw as a means of indicting everyone in the art world, just those who have been corrupted by avarice at the expense of the art. I would've preferred a much stronger take from Gilroy than what we get here, but as a star-studded monster movie with some funny insights into the art world, it should find an eager audience as part of Netflix's lineup.